The Malaysian-based Sikh Women's Awareness Network (SWAN) aim to empower women and enhance their perspectives in life through talks and workshops and improve livelihoods via skilled training. Women are after all, the nucleus of the family and when she is taught to fish, she teaches the whole family to fish. In an interview with Asia Samachar, SWAN president Satwant Kaur shares their vibrant and engaging activities, milestones and developments and upcoming plans including the Family Carnival scheduled for this Sunday, 24 July at Bangsar Sports Complex.This will be a delightful family getaway, where there is something exciting for everyone, she says. Swans are beautiful aquatic birds that are members of the duck and goose family. They symbolise grace and beauty on many levels. Hence, it is indeed a beautiful acronym for the Sikh Women’s Awareness Network or SWAN, which is run by women, to empower women. SWAN, a Malaysian registered Sikh women’s organisation, was set up in April 2004 with Rajinder Kaur at the helm as founder and president. Its objective is to create awareness on various issues to bring about changing attitudes for the betterment of society. It does this by empowering women and enhancing their perspectives in life through talks and workshops and improving women’s livelihoods via skilled training. Women are after all, the nucleus of the family and when she is taught to fish, she teaches the whole family to fish. The community often mistakes SWAN for a welfare body. It is not. Welfare issues, as and when they crop up, are usually channeled to the Sikh Welfare Society Malaysia (SWSM), another member of the Coalition of Malaysian Sikh Organisation (CMSO). Hence, role overlap is avoided. Asia Samachar speaks to Satwant Kaur, the current President of SWAN, who assumed the voluntary office in 2015. She is supported by an executive committee comprising volunteers who commit time and energy in creating awareness to empower women. SWAN endeavours to support not only the spiritual and social needs of women but also their economic, intellectual and physical well-being. Satwant shares with us their vibrant and engaging activities, milestones and developments and upcoming plans. SWAN occupies a centre at 10, Jalan SS 1/4, Kampung Tunku in Petaling Jaya. Activities are held at the centre, and external locations as well, throughout the year. They run weekly programs like Golden Swans and Bollyrobics. They have skilled training once a month. It also organises talks at gurdwaras in Petaling Jaya, Shah Alam and Pulapol to reach the masses and the man on the street. Talks and seminars are conducted from time to time, to educate and disseminate information. Speakers are experts in their field and are sourced either independently or from the community. Health matters are important, as women generally will think of everyone else except herself. They are the catalyst in enriching and building happy and dynamic families ready to face external challenges through the nourishment of holistic development programs. The health talks have been on diverse areas namely hypertension, stroke, breast cancer, dealing with menopause, exercising and staying fit, healthy living and ageing gracefully. Health Camps have been conducted in many areas to create awareness on the importance of regular check-ups. Parenting topics touched on bonding, nutrition, child raising and domestic violence. On skills enhancement, appealing topics and lively workshops were held on floral arrangement, versatile saree tying, fine dining etiquette, dupatta tying, computer classes and public speaking. 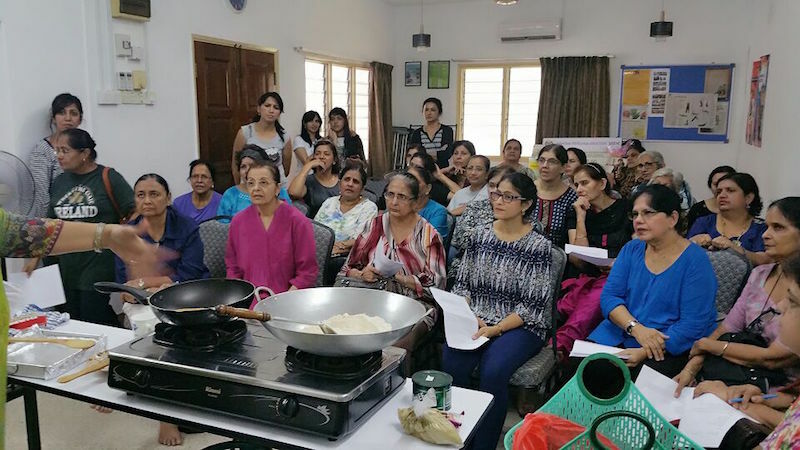 Hands-on cooking and baking sessions are a favourite among the women folk especially on preparing vegetarian, traditional and healthy food. Both male and female chefs have made their presence felt. Motivational, self-empowerment and self-defense talks have been well received. Also sessions on will writing and crime prevention. Local trips are organised occasionally and they are self-funded where they are paid by participants. They provide women with the opportunity to connect and among others, discuss common challenges and resolutions. In the next two months, SWAN plans to conduct First Aid and CPR workshops. Satwant is concerned about the lack of awareness and knowledge on these crucial areas. Once, they are aware, they can help others in need. A recent project embarked this year by SWAN is the formation of the Legal Aid group to provide free legal services. Their panel of volunteer lawyers have been assisting women from India who faced immigration issues, also women who have abusive relationship. A trained group is actively involved in providing counselling service to those needing them. The SWAN Centre has certain medical facilities namely an adjustable medical bed and various type of walkers for loan, for those requiring them. Doctors also provide medical service. On Thursdays, Mrs Jagjit Kaur conducts a two-hourly morning program with the Golden SWAN Girls in their 60’s and 70’s. They do prayers, workouts and share health remedies together. 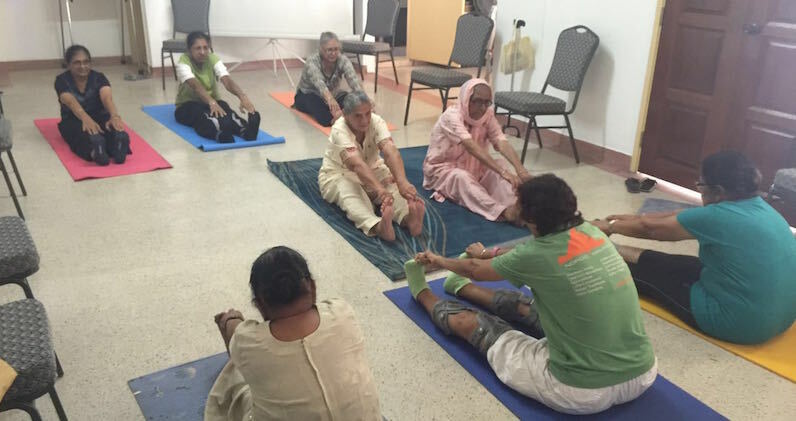 The purpose is to provide an engaging platform for older women to come out, socialize, exercise and learn. Every Fridays, Sunita would lead a group of energetic women on bollyrobics steps and movements for a good two hours of cardiovascular workout. Over time, these talented ladies have stepped up and perform at family and friends’ Sangeet and wedding. SWAN has conducted various camps which include Family Camps on nurturing family relationships; Sirjana Camps to inculcate religious values in women and Anand Camp which represents an enrichment program for married couples. Another project Satwant speaks fondly of is on Urban Farming. It is therapeutic and keeps you in touch with mother nature. Should anything untoward happen in the city, there will be insufficient food for survival, she cautions. Unlike our parents and grandparents times where we had ample land to plant our crop, today’s urban living makes this tradition a challenge. SWAN has put together three planter boxes at the Centre producing organic and pesticide-free crops. They have since harvested their home grown kangkung and okra. Long beans and four angled beans are on the way. These organic vegetables are harvested weekly, packed in plastics and sold. Again, this project was undertaken to create awareness and encourage women to replicate the same farming activity in their backyard. Seeing and harvesting is believing! 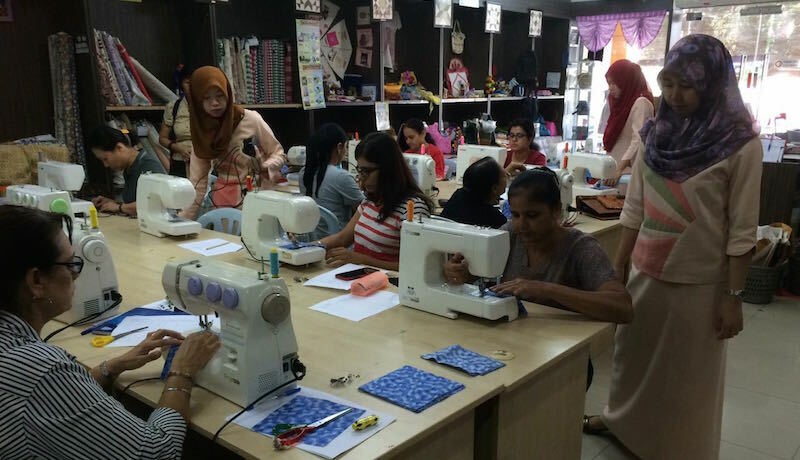 An entrepreneurship project entitled Jahit and Berdikari or a Sew and Earn course is now underway with 60 women participants. It started in January and will end in November 2016. The participants are based in various locations which includes Sungai Petani, Ipoh, Selangor and Johor. This program is funded by the Socio-Economic Development of the Indian Community (SEDIC). They are learning various sewing techniques encompassing smocking, quilting and patchwork to enable them to produce bags, dresses, curtains, cushion covers and other saleable items in demand in the market. This involves making items out of recyclable material. This initiative helps single mothers and women in general to earn the extra income by starting their own business. She hopes some successful entrepreneurs will emerge from this project. Single mothers sometimes get a rough ride with the eco system. Here, SWAN has helped some of them to come out of their depression and confined world and raise their self-esteem to stand on their own. Many take comfort that they have an organisation that they belong to without prejudice. It is so joyful and fulfilling to see them flourishing over time! Women play many roles in society and SWAN programs cater to their healthy development. Being a pillar, they enrich their families and entire community in the process. In connection with this, Satwant would like to humbly reach out and empower more women. She urges them to attend sessions which are of interest to them. SWAN disseminates information and activities on their social media website i.e. Facebook and also Whatsapp group. Their next event is the Family Carnival scheduled for this Sunday, 24 July at Bangsar Sports Complex in Kuala Lumpur from 9 am to 4 pm, with a minimal entrance fee of RM10. It aims at bringing the community together. Instead of having separate events to celebrate Mother’s Day and Father’s Day, they are consolidated for the family as a whole. Among the activities planned include cultural performances and vocal sessions by our local talent, bhangrarobics by Susheel Kaur – an instructor from Sweden, food stalls, jumble sale, fun games and lucky draws. Stalls will be selling turmeric products, cookies, Pakistani clothings, fabrics, kurti tops, office wear and ceramics. SWAN is also compiling a booklet on health remedies and recipes from their various sharing sessions, at the Carnival. Satwant encourages the community to come for this family bonding time together. There is something exciting, for every member, she says.